An enclosed hut circle settlement (a settlement showing evidence for one or more hut circles (roundhouses), enclosed by a distinct boundary earthen bank) and a round cairn (a roughly hemispherical mound constructed primarily of stones, normally containing or covering one or more human burials) of Romano-British date. 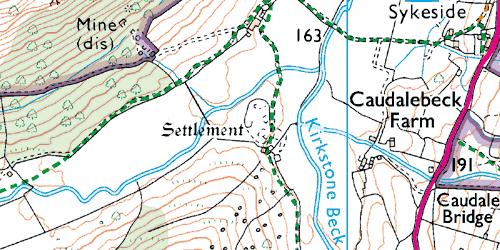 The monument includes a Romano-British enclosed stone hut circle settlement located on a gentle slope at the foot of High Hartsop Dodd, south of the confluence of Dovedale and Kirkstone Becks, and a round cairn 30m east of the settlement. The enclosed stone hut circle settlement includes a roughly oval enclosure bank up to 5.5m wide and 1m high having two entrances; one on the west where the rampart is projected inwards on the northern side of the opening, and the other on the south-east where the rampart is projected outwards on both sides of the opening. Within the enclosure are five hut circles; two in the northern half measuring 11.5m and 6.5m in diameter, and one at the southern half, close to the enclosure bank, measuring 9m in diameter. 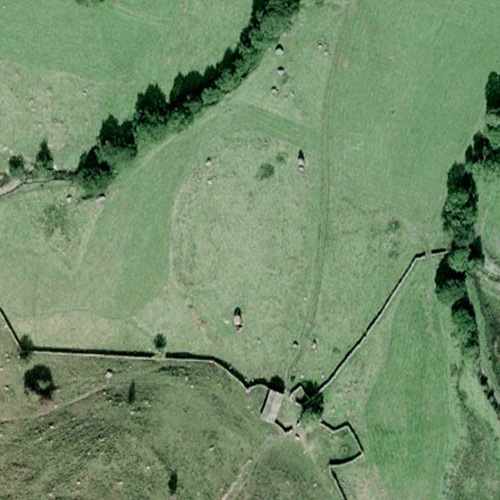 Adjacent to this latter hut circle are two roughly circular depressions interpreted as the sites of two hut circles measuring 13.5m and 10m in diameter. Immediately to the south-south-east of the enclosure bank is a roughly rectangular enclosure measuring approximately 34m by 27m which contains short lengths of earthworks in its western half. To the north-east of this enclosure, and separated from it by a narrow passageway leading to the south-east entrance of the main enclosure, are faint traces of a roughly rectangular depression. On the site, and in several places incorporated in the rampart, are a number of boulders of considerable size. About 30m east of the main enclosure, and connected to the rampart by a slight scarp, is a low knoll on top of which is an slightly oval cairn of largely turf-covered stones up to 1m high with maximum dimensions of 14.6m by 13.7. All modern walls, gateposts and field boundaries are excluded from the scheduling, although the ground beneath all these features is included. Lots of earthworks and large boulders within this Ancient Settlement.